Its Endy here and I’m reviewing this book for my mom! I’m a 12 year old and loving Ghostbusters! I LOVED the new movie and thought it was so much better than the original…please don't hunt me down. This companion book is awesome amazing! Beware that this book is something you want to read AFTER you see the new movie. I think that if I would have read this before seeing the new movie that I would have been a little lost. This book gives you so much more information vs. what the movie did. We get full back stories of the girls and there are just so many more jokes in the book. Much of that I wish would have made the movie. The author did a great job turning the movie into a novel and the actors did a great job bringing it to life. This is a must read for any fan of Ghostbusters and I hope we get more down the road. More movies and more books!! 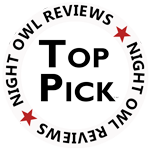 Thanks so much for sending this to us Night Owl Reviews. It was a blast! And we all know who were going to call when more of these come out!! Hint Hint ~ Eny call the Endy! The official novelization for a new generation of Ghostbusters, based on the new movie starring Melissa McCarthy, Kristen Wiig, Kate McKinnon, Leslie Jones, and Chris Hemsworth and directed by Paul Feig! After Dr. Erin Gilbert is disgraced at a job interview for her belief in ghosts, she is roped into investigating a haunting by her former colleague, Abby Yates and Abby’s new co-worker, Jillian Holtzmann. The three scientists soon discover that some specters do far more than go bump in the night. Together, these four would-be paranormal investigators are determined to find out what’s going on, save their city, and maybe make a profit while they’re at it. The team must stop a mysterious evil known only as Rowan from destroying the barrier between this life and the next and turning Manhattan into a literal hellscape.